Running a six minute thirty second final mile at the Green Mountain Marathon to qualify for the 2010 Boston Marathon by thirty seconds. I enjoy helping others meet their marathon goals. 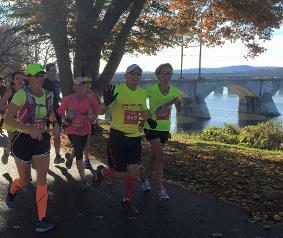 There have been several occasions where I have helped marathon runners endure and keep a consistent pace during the critical latter miles of a marathon. A member of my pace can be assured that they will have a positive and memorable marathon experience while I provide the necessary leadership to ensure their success. Have a plan going into the race and stick with it! Stay positive and enjoy the moment! My wife, Cindy, and I are active contributors to the Allentown Rescue Mission. We believe that it is very important in life to give back to those in need.